A quick and easy creamy quiche, perfect to be served with vegetables as a lighter meal option. Line a 26-cm tart tin with shortcrust pastry. Freeze for 10 minutes. Transfer tart tin to oven and blind bake pastry case for 10 minutes at 180 degree Celsius Cool. Heat oil in a saucepan and cook onion until softened. Add cream and CONTINENTAL Professional Gluten Free Garden Pea & Ham Soup Mix and simmer, stirring continuously for 5 minutes. Transfer to a bowl and cool. Add eggs, ham and peas to the mixture and season with pepper. Pour into tart shell. Bake for 25 minutes at 180 degree Celsius until set. 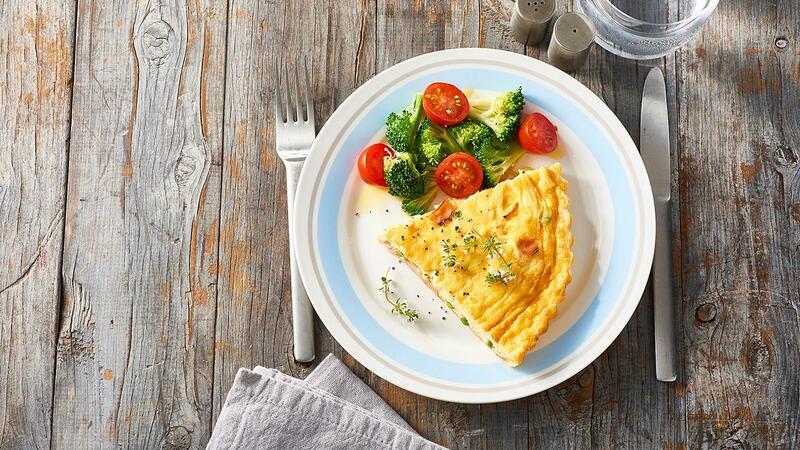 Serve quiche with steamed broccoli and tomatoes. Add extra vegetables to the quiche to bulk out.